One of the best ways to encourage engagement, and build a strong community is to encourage your members to communicate with one another via a message board. The message board (forum) is organized into boards and topics. The boards correspond to a category of conversation, and within each board are different topics relevant to that board (category). Once a topic is posted (typically a question), members can then start the discussion and reply to the question (or to other members' replies). Members have the opportunity to opt-in/opt-out of various boards. If opted in to a given board, they will receive emails when new topics or responses are posted within that board. Board-only/Committee-only/Member-type-only - boards can be set up that are limited to your association executives (board members), limited to project/committee members, limited to given member types, or open to all of your general members. Email List Service - The email list service (sending a message to an email address within your org, which is then relayed to your members) is a convenient way to send messages to your members who have opted in to receive them. Integrated with our Message Board system, you can set up multiple email lists for interest groups and committees within your organization. 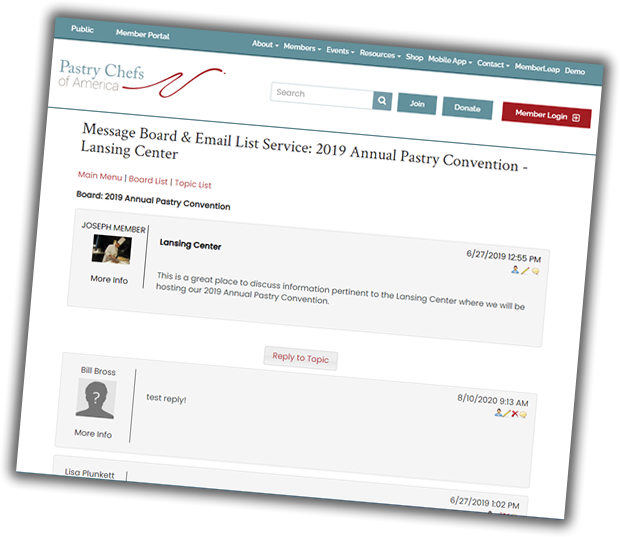 Message boards enabled with the email list service are also a convenient way for boards and committees (and other small groups) to have a discussion among themselves. The convenience of email, combined with the record-building of a message board. Access to Post/Respond - participation requires that a user has a login. Typically, this means members-only, but it is also possible to grant non-members access if you so choose.